Posted January 2nd, 2019 by Melody Taylor-Fliege & filed under Change, Leadership, Life Coaching, New Years, Self-Improvement. Complete this sentence. If no body’s feelings would be hurt, money and time were not issues; I would absolutely want to… Travel abroad? Start my own business? Learn a new language? You could start today with language CDs, E-books, online classes, and even look up and bookmark tickets for your first trip. It’s certainly easier to stick with what you know then taking action towards your dream even after looking within and discovering your authentic voice calling you to be what you were meant to be. Although your knees may go weak, you’ll always get butterflies or maybe a little queasy just before you leap; fear will no longer be your reason to quit. 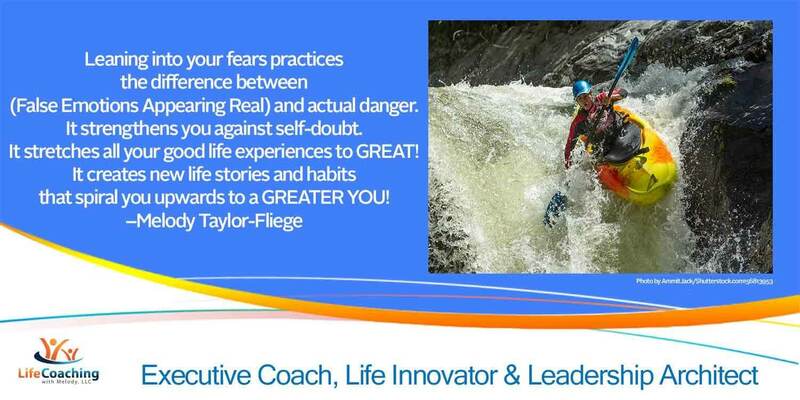 Leaning into your fears practices the difference between (False Emotions Appearing Real) and actual danger. It strengthens you against self-doubt. It stretches all your good life experiences to GREAT! It creates new life stories and habits that spiral you upwards to a GREATER YOU! What’s the end of your sentence?